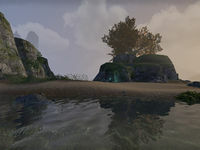 Balefire Island is an island off the coast of Glenumbra, north of Eagle's Brook and Camlorn. A necromancer named Grivier Bloodcaller resides here. Kill the necromancer, Grivier Bloodcaller, at Balefire Island.